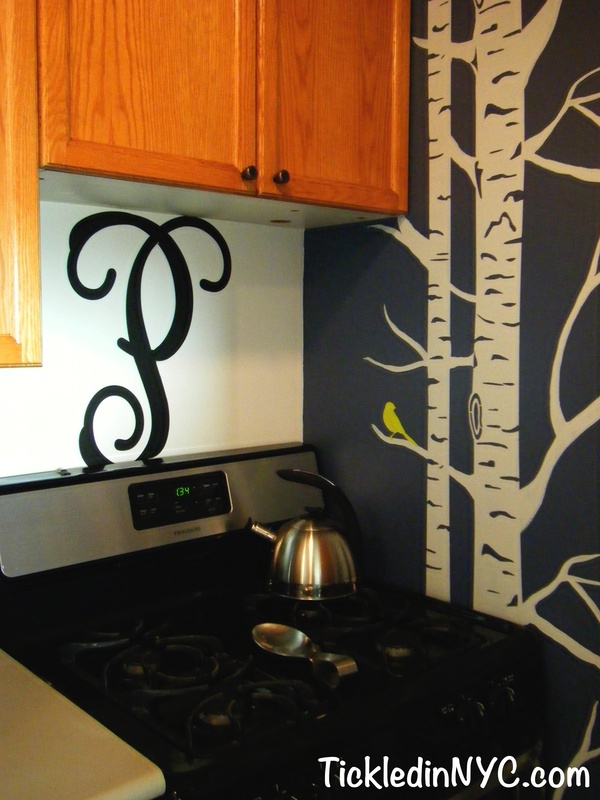 Although I had reached the end of my long hard painting project, there were still some finishing touches I wanted to add to the kitchen. 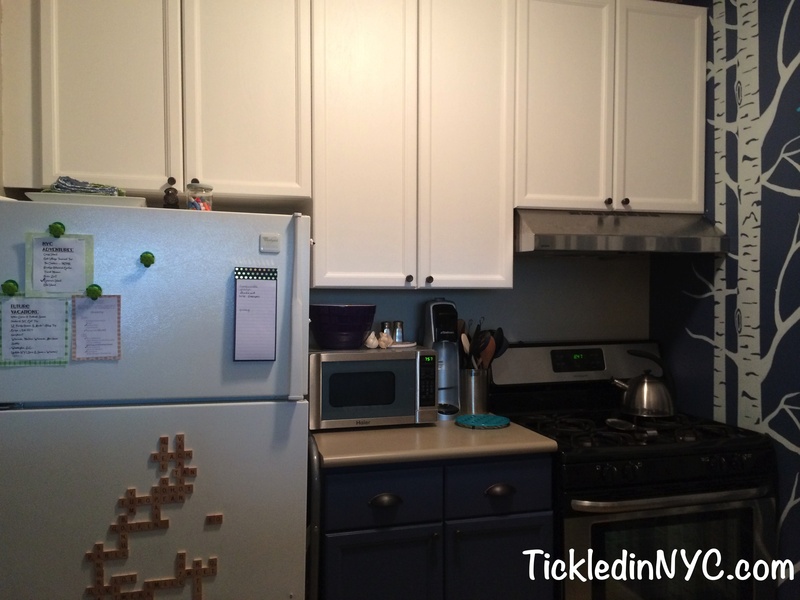 Since moving in to our generously greased kitchen, I wondered if adding a vent above the stove would prevent a lot of the grease buildup on our popcorn ceiling (gross!) and on our freshly painted cabinets. After weeks spent scrubbing and beautifing those puppies, the last thing I wanted to do was get them all sticky again! 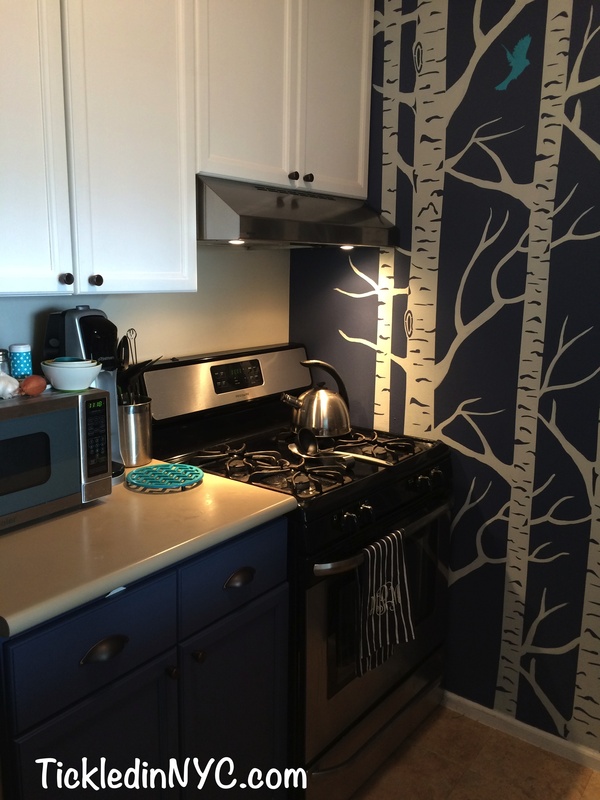 I’d been researching my options for a while, and although a microwave with a vent/fan would have been an amazing addition to clear up counter space…we just didn’t have the clearance above the stove to safely install the super-sized microwaves that are designed for those spaces. As you can see, there is a hole in the bottom of the cabinet and an electrical socked behind the doors to allow for the addition of an electrical device…but not a full scale microwave, unfortunately. 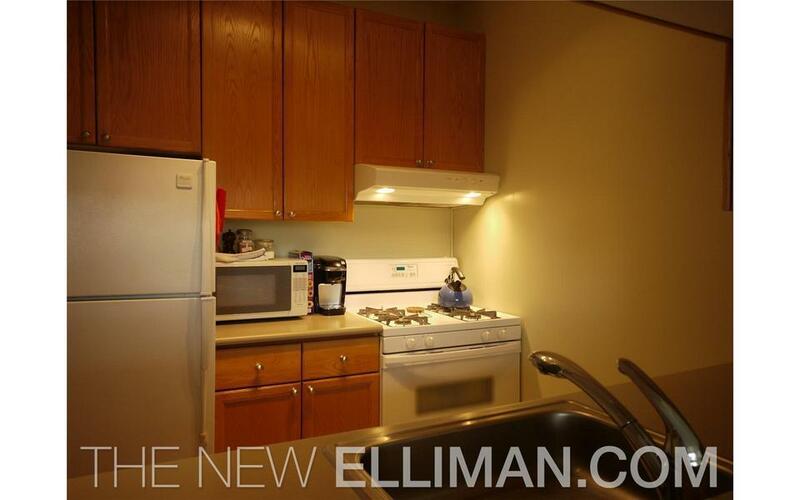 When I was wandering past sales in StreetEasy, I’d seen a photo of a kitchen in my building with a hood and a light above the stove. 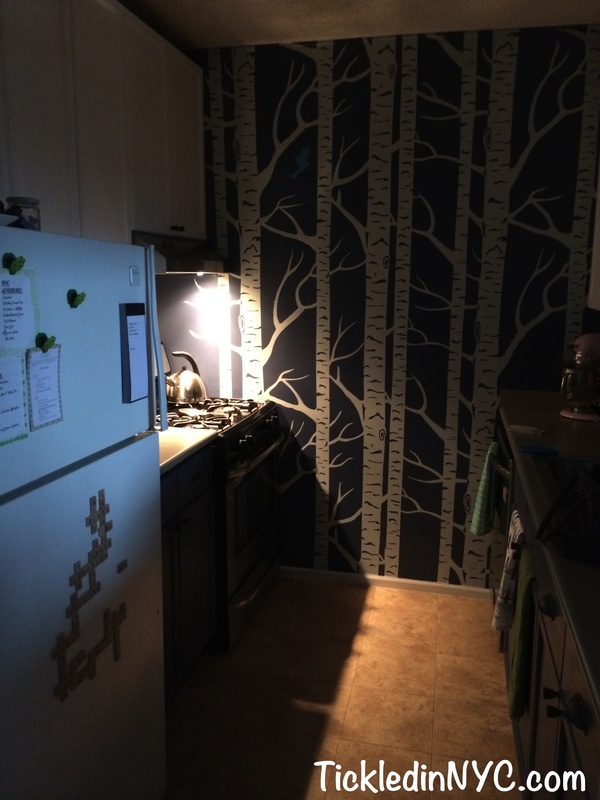 Since the lighting is pretty terrible in the kitchen, I thought this was just the ticket! (Although, maybe not THAT particular style). First, I measured my space so I knew exactly how wide my hood could be, and then (as always) I checked out the reviews to see what everyone thought of their purchases. I made my decision based on aesthetics, price, lighting, and noisiness of fan. Apparently, a lot of people have really strong opinions about fans that are too loud. So I decided that if noise could make me less likely to run the fan, then I shouldn’t risk the bad reviews. Luckily, the prettiest hood also had excellent reviews and was an awesome price! I found it first on Overstock, but it didn’t have any reviews there. Over the months I was contemplating it and a couple other hoods, I was able to find it on Amazon with a lot of extremely helpful and promising reviews. I was sold! When the price dropped to almost half the list price, I decided to go for it. The reviews also encouraged me to purchase the lightbulbs that are not included, and an extra vent (which I have yet to use…though it’s dishwasher safe!). 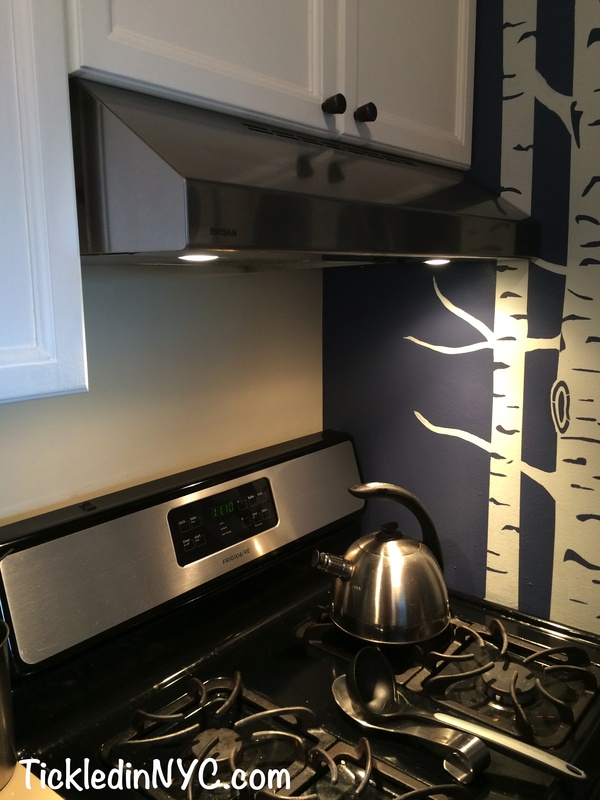 I’d waited to order the hood until my cabinets were painted, and I couldn’t wait to put it up once it arrived…BUT “putting it up” is never exactly EASY, is it? 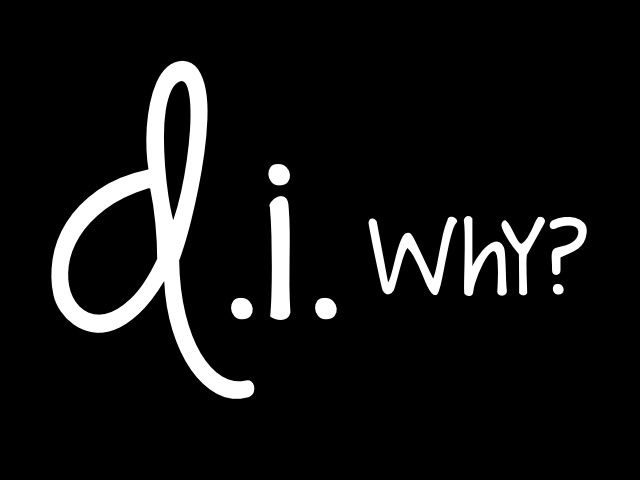 Enter classic Melissa – d.i.why? project. Can’t figure out how to detach top panel to attach hood to cabinet. Electrical plug isn’t in the same location as the pre-drilled hole in my cabinets (I should have thought of this possibility!). I don’t have a drill bit large enough to get a quarter-sized hole in my cabinet where I need it. I can’t remember how I figured out detaching the top panel. I think I just grabbed a screw driver and started unscrewing everything! Eventually I got to the shell which held all of the hardware I needed, and the instructions. Note to manufacturer: Perhaps you were worried the instructions would get lost if they were outside the device…but in the future, please at least leave me instructions on how to get to the other instructions!! As for the hole-drilling problem, I’m lucky to live in a building that has maintenance workers on staff who are willing to help out with minor stuff like this. However, the poor guy who came up to help me wasn’t having much luck either. The drill bit that we needed was too dull to get through my cabinet…which caused the drill to die. He had to go find another battery, but he couldn’t find another drill bit, so we settled for a smaller bit that would still barely allow the plug to pass through. (Are you sensing that the word barely is going to come back and bite me? You’re right). After holding up the hood and making sure that the hole was in the right place, he headed out and left me to finish up. All that was left now was following the very specific instructions on where to drill my screws, sliding in the vent to hang onto the screws, and re-installing the cover that was hiding all of the screws/instructions in the beginning. Easy right? 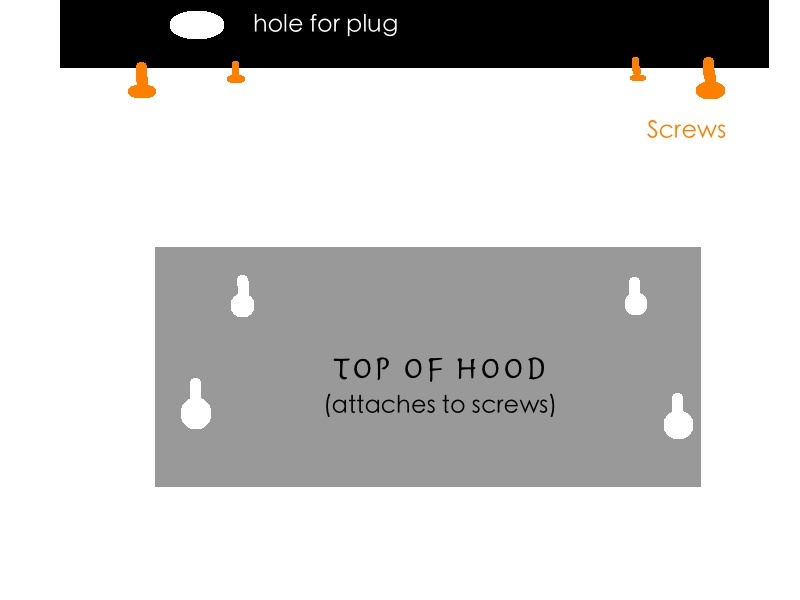 Getting screws to penetrate hard plastic barrier on underside of cabinet, without moving/angling from their specifically measured location…you know what I mean right? Reaching over stove with my recently injured back, holding very heavy drill, attempting to force tiny screws into hard plastic barrier with absolutely precision. After pulling out very heavy stove (with bad back), climbing onto counter and behind stove to retrieve tiny screws, I cannot get stove to slide back into its place. I seriously tried everything to get that stove back where it was. I slid it back and forth, rocked it, picked it up (ouch! ), no luck. Turns out, our apartment does NOT have square corners (this is important later), and the stove was magically forced there many years ago by very strong men (I think was in tears at this point). Sheer determination and stubbornness allowed me to keep trying and eventually (maybe an hour later?) I realized that the stove was getting stuck on a screw on the tipping guard (did you even know those exist?! They do. See here). I tried to climb behind the stove again and screw down the troublesome screw or remove it entirely, but no luck. As I was trying to lift the stove over the bracket (for the fourth or fifth time) I realized that maybe the stove has lifts! Apparently my sliding back and forth had spun the lifts so that they were too low to go over the guard. I got out my wrench and unscrewed the feet to lift the stove as much as possible and in it slid. Grrrrrr. But it was done. SO! All that trouble and I still didn’t have the screws in! I laid towels around all of the edges of the stove and tried to cover all the possible screw escape routes. Then, I began again. Most of the screws did all right, but one in particular really didn’t want to go in straight. I decided to see if the vent would go up anyway…and with some effort it did – Phew! Now, I needed to get the electrical plug inserted, and we were SET! Plug won’t fit through the top of the hole. I have to attach it to the hood and then slide the hood into place over the screws. As you can see, my installation required the vent to slide over the head of the screws and then slide backwards into position. What my perfectly plug-sized hole did not allow was any room to slide back into position. I decided that since my holes were already drilled in the right spots, I could install the vent directly into place if I removed the screws, placed the hood, and replaced the screws directly into the narrow portion of the screw hole (see above) and lock it into place. After a few attempts, and accidentally scraping my brand new white paint off a large section of the side of the cabinet, I decided that I couldn’t hold up the vent by myself while trying to screw it into place. I waited until my husband came home. This was definitely a two heads and four hands type of project! With some more minor issues we managed to get the hood installed right where it needed to go! And then, I rested my back…for a little while.